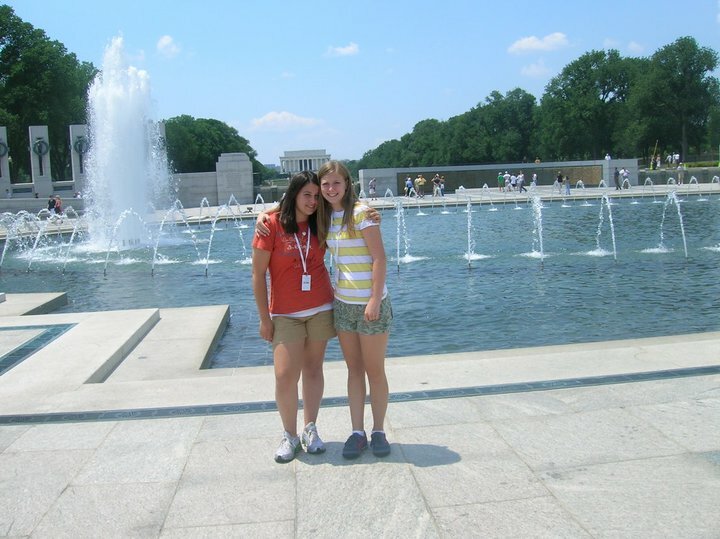 Washington D.C. – Round 2 | Drake in D.C.
My friend Katy & I posing for a typical touristy photo in Washington D.C. in 7th grade. The last time I was in Washington D.C. I was wearing that touristy name tag around my neck all the time. Being in seventh grade, it was probably reasonable to ask us to wear name tags around our necks like dogs in order to keep track of all 80 of us. It was a wonderful experience but I was more concerned about the social aspect with all my friends than really taking in the sites (don’t tell my mother). This time however? I’m hoping to do Washington D.C. “right”. Not only will I actually remember this trip better but the meaning behind watching a President take on his second term when I had the opportunity to vote for him to be there is incredible. Sitting on the steps of the Air & Space Museum back in 7th grade! Don’t neglect to notice the name tags around our necks! the start of a new year, a new term offers more potential and opportunity for our country as we move forward. I hope President Obama addresses where he was four years ago and where he’d like to see our country in the next four years. What expectations should I have of him this term? What is he hoping to get accomplished. I don’t want such a splendid day to be entirely bogged down with the issues of unemployment, government deficit, etc. Obama’s Inauguration speech back in 2009 touched on the hard paths that the Americans before us have overcome and how we’re treading our path for future ones. I hope he comes back to this idea on how we’re still moving forward. The Inauguration is a trip of a lifetime. When strolling through the random booths for J-Term trips last spring I couldn’t help but go “I could do that next year if I wanted”, “I know a book that I could read to learn about that subject” but then the Inauguration? That trip won’t be repeated for another four years! This is a once in a lifetime opportunity to go to DC and attend the Inauguration for a class and I am so thrilled to be a part of it. DC’s culture is fast-paced and cut-throat and I am beyond excited to be a part of it. While in Washington I hope to learn more about how the past has affected the present and make better connections with our nation’s history. I want to take something away from every site we visited and to better understand how our country has unfolded the way it has due to events like the Vietnam War, the Declaration of Independence and the Holocaust. I also want to learn more about what it would be like to work there one day. Working in the political circuit doing PR would be a dream come true for me a few years from now and I want to be able to see if I really could picture myself there. Could I survive and thrive there? We’ll find out – D.C. here I come! Visiting Williamsburg with my locker partner Larissa!